Sport: There has been a good number of trout caught over the last week with both bank and boat anglers enjoying some good sport. Last week saw the hot bright conditions continue but for the last few days we have had a bit of drizzle and much more cloud cover which is always beneficial when trout fishing. The result of this cloud has seen the trout move higher in the water and where as last week the best catches fell to lures fished extra deep on di7 and di8 fast sinking lines floating and slow intermediates have been the best choice. 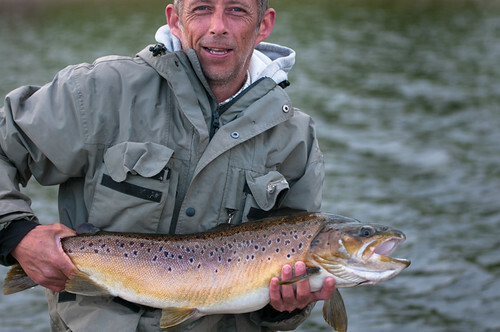 Brian Hitchen has been amongst the trout fishing into the deeper water off Hollins point but found the trout high in the water where a Montana on a floating line was his best tactic. Mr Mutty fished from Bell point and landed 4 fish weighing 3lb in a short session this week. A dry sedge pattern was his best fly. Karl Davies was also successful with dry flies fishing along the east bank and the dam. Karl took all his fish on a daddy long legs. Ian McCloud also found fish around the dam landing 6 fish with his biggest weighing 6lb. Ian found his best tactic to be pulling a booby an a di3 sinking line. Sean Proctor stuck with the minkies that have been working recently but fished them higher in the water. Sean had a good number of other chances. Mr Garin had a good afternoon afloat drifting all over the lake. He opted for a dry daddy and finished with 6 fish to the boat. Jamie Presho landed 5 fish in just a couple of hours whilst fishing around the tower. He found a jerky retrieve best and caught on damsels and cormorants on a di5 sinking line. Stuart Halford had a good day bringing 7 fish to his boat. Stuart caught all his fish on muskins twiddled on a di3 sinker. Derek Moore and Felicity Appleton landed 11 fish between them. They took the majority of their fish from Gull island and the main basin on cats booys on di5 sinking lines and dry flies right in the surface film. Neil Ashworth and Paul Peters caught 10 trout between them with blobs and diawl bach on di3 sinkers although the trout were not at all deep in the water as they stripped their flies back fast as soon as they hit the water. Steve Bland and Bob Fitzpatrick caught 10 fish between them and had numerous other chances. They found the key was to get the trout chasing the flies across the surface by stripping a booby as fast as possible as soon as it hit the water to get it to skip. Colin Fitz john brought 8 trout to the net whilst drifting in the dam area. Colin took all his fish on dries. Another angler to catch on dries by the dam wall was Jim Hunter who took his 12 trout by 2pm. The top catch yesterday want to Bob Fitzpatrick with his 6 fish caught on both orange and black and red midas and daddy/hopper. Dry flies were the best tactic again today fished either down the middle of the dam arm or bang in the middle of the main basin. Richie Kelly and Gavin Murray landed 7 fish between them whilst Stuart Halford caught 8 fish with all falling to ginger or orange midas patterns. Dave Vose and Steve Horrocks had lots of action and finished with 9 fish to their boat including the biggest fish of the day a 6lb 10oz rainbow. They caught at Grindys lawn with dawsons olive on a floating line the best tactic. A dawsons olive was also the top fly for Jimmy who has been staying with us for a few days. Jimmy caught 6 and lost 5 others from various areas of the lake. Syotw Paul. This entry was posted in Stocks Reservoir Fishing Reports on July 24, 2018 by staff.